Sykotakia me Lahanika (pr. see-koh-TAH-khia meh Lah-chah-knee-KHA) are chicken livers with vegetables. 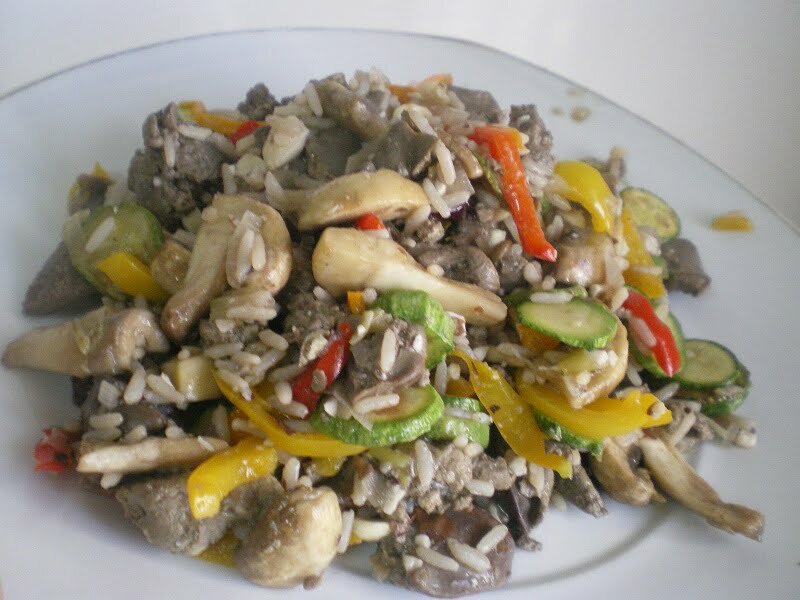 This easy and nutricious recipe is made with chicken livers, vegetables, rice, nuts and poached grapes. The livers and vegetables with the spices and other ingredients blend together to to make a surprisingly mild gourmet dish. Many people shudder at the thought of cooking or eating liver but in Greece we eat it a lot. I love liver, especially, chicken livers, however, I don’t cook it very often as chicken giblets are high in cholesterol and only cook it two or three times a year, mostly during Easter. However my cholesterol levels are back to normal and most of the time I do eat healthy, so that once in a while I can indulge into some of my favourite food. Last year when we went to Switzerland, we visited Grenoble, in France and when we went to a restaurant for lunch, on the menu of the day they served chicken liver with green salad. We loved it so much that when we came back I tried to remember all the flavours to make a similar dish. Since I never posted this recipe so as actually after a year I made chicken liver again, I am posting both recipes today. Wash the livers and remove any fat. In a saucepan bring some water to boil and add the livers. Boil for 1 minute and then remove from the heat. Allow to cool and then drain. (The boiling part is optional). Heat olive oil in the sautéing pan and sauté the onion until translucent. Add the chicken livers and sauté on all sides. Add the wine, salt, pepper and bay leaf and finely the tomatoes. Mix well, cover with lid, lower heat to minimum and cook for fifteen minutes. Add the walnuts and cook for another 2 – 3 minutes. Prepare the salad and toss with the vinaigrette. Serve the chicken giblets on top of the salad. The next recipe is also my concoction. During Christmas I stuff the turkey with a chicken liver filling and based on that recipe I have made some changes and added some vegetables and more ingredients to make it a meal by itself. Fianlly, instead of adding raisins, I poached some grapes and added in the recipe. However, if grapes are not in season, the raisins are also wonderful. The above recipe is included in my cookbook Mint, Cinnamon & Blossom Water, Flavours of Cyprus, Kopiaste! Wash the giblets and remove any fat. Cut into smaller pieces about 1 inch and wash again. In a saucepan bring some water to boil and add the giblets. Boil for 1 minute and then remove from the heat. Allow to cool and then drain. In a sautéing pan add 1 tablespoon olive oil and sauté the vegetables. Remove to a platter and set aside. Add the remaining oil and sauté the onions and the garlic until translucent. Add the giblets and sauté for a few minutes. Add the rice, almonds, (raisins) and spices and the wine and mix for 1 minute. Add the water, lower heat and simmer for about fifteen minutes, checking it every now and then. Five minutes before the end add the vegetables and poached grapes and cook for another 3 - 5 minutes. Remove from the heat and allow to rest for 10 minutes and absorb all the juices before serving. so tasty recipe,ivy!the chicken liver is full of good substances,for children is very healthy! I love gizzard salad…it looks really yummy. In Chinese cuisine, chicken gizzards are very often marinated and used as an appetizer together with other salad. Lovely! I am a fan of chicken livers and I love this dish Ivy. The flavors sound great and as I have often combined chicken livers with raisins I am sure the grapes went quite well. I love chicken liver, haven’t tried it with poached grapes before. This looks so yum! I love chicken liver and the only way I have ever made it is to saute it with lot of pepper and fry it. Your method is so novel, a must try for me. I’m getting better at appreciating chicken livers Ivy! I must say I love the preparation of these. And that salad is beautiful too! The pomegranates add a lovely touch! Wish i had the courage to eat liver, i am chronically shrt in iron ( according to my doc) and they say liver is really good, but i don’t dare to eat it. So every day i pop a iron tablet. Very interesting flavours here Ivy! Not your ordinary liver dish! I am def going to try this dish out! I love chicken livers too and rabbit’s! My parents who are 75 and 78 cook chicken livers for breakfast once or twice a week and they fry them in a bit of olive oil. Their health is superb!!! It’s really interesting the way you combined them with other ingredients 😀 I would love to try it your way. Oh I haven’t had chicken livers in a LOOONG time. I think it’s time to change that. Your recipe sounds so good. When I was growing up, we had chicken livers a lot, but I haven’t had it in a while. Chicken livers sound delicious with poached grapes! Wow, Ivy! This dish is so colorful! I never would have thought in a million years it was chicken livers. I think even I could be tempted to try it! LOL – you’ve got that right Ivy. Apart from the cringe that I felt when I read that this was a liver dish, it does look delicious – and after all, pate is a delicacy which I don’t mind. I have never eaten chicken livers before but the dish looks so beautiful and packed with flavours, I think I am going to try it. That’s a very colourful dish…I would taste it, despite my aversion to liver. Peoples’ tastes change and I do try foods (like liver) once a year to see if I’ve changed. Kai tou xprono!